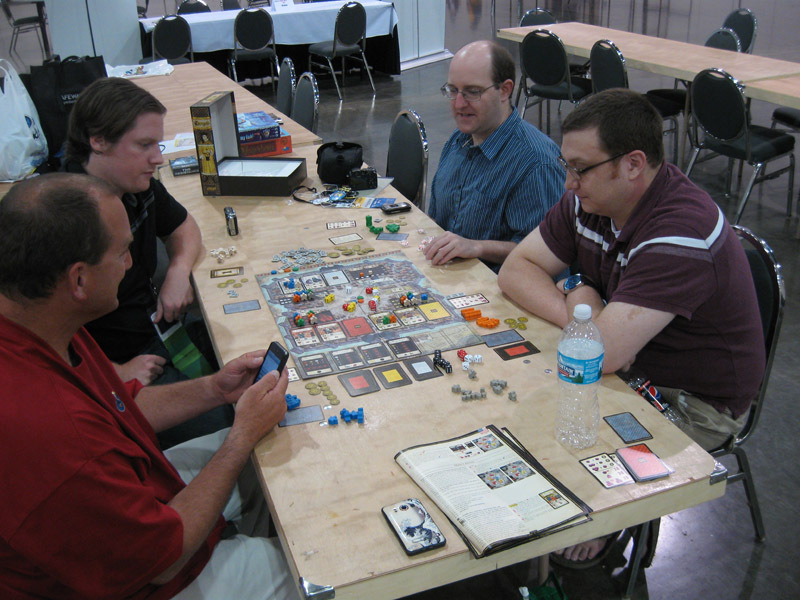 I’m sad to say that there was no great Banana Quest on Day 4 of Origins (in fact, we didn’t even eat until 4 p.m.), but there was plenty of good, old-fashioned boardgaming and spending quality time with some new friends. The day started late after some unexpected, but very nice sleep time, but we made the best of our last full day. And now, the day in pictures. Observing a demo of Engage, by Table Tactics. It was a fascinating diceless system that I'd like to take a closer look at soon. 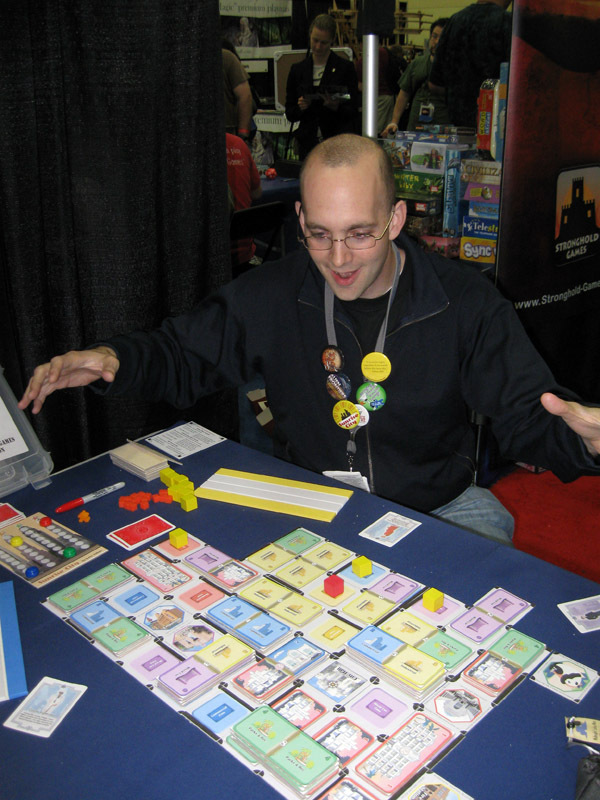 Marc Specter thought the prototype of Sunrise City could use more Godzilla attacks. After a long late lunch at Barley's (surprise), we hung out with our friends at Moosetache Games. 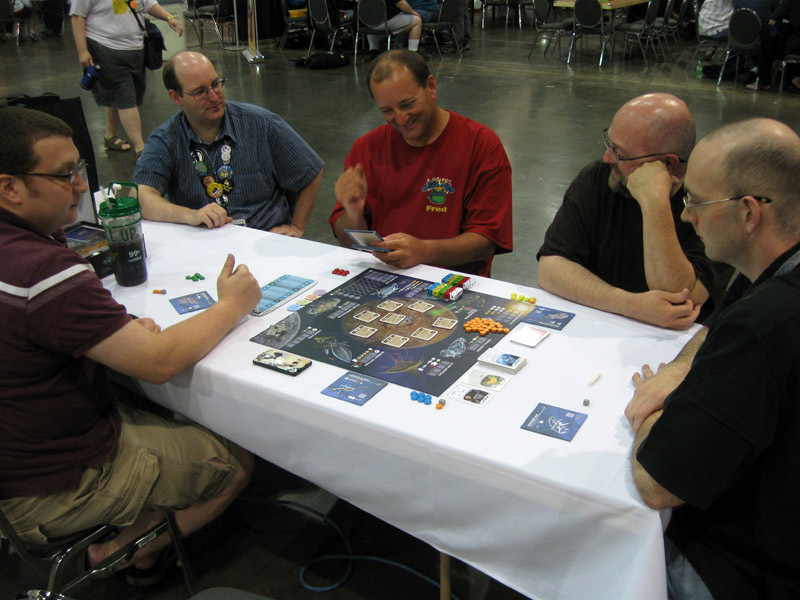 Playtesting the Alien Frontiers Faction expansion with Shawn, John, Fred, David and Marc. I got shellacked, but it was great fun. Time's Up: Title Recall is insane. And fun. Look for a very special video of our antics, coming to Dice Hate Me soon. 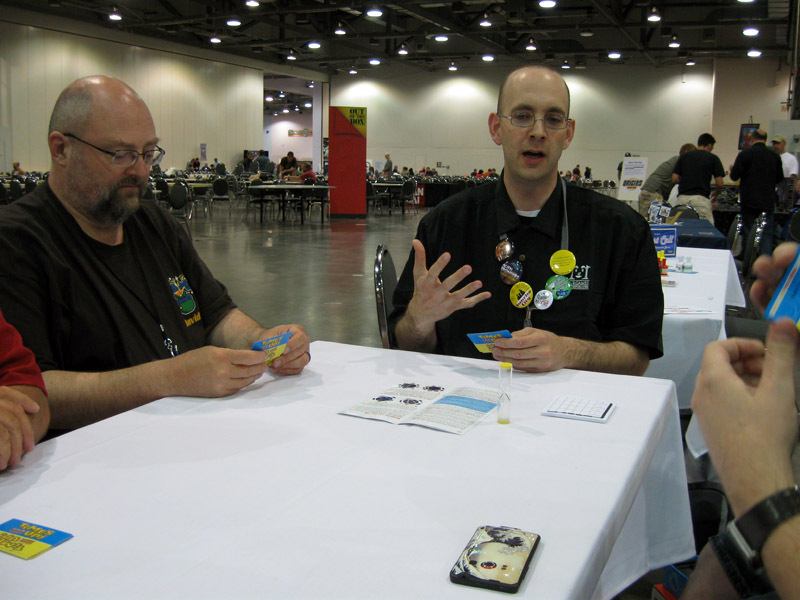 Trying out John Moller's prototype game, Flummox! 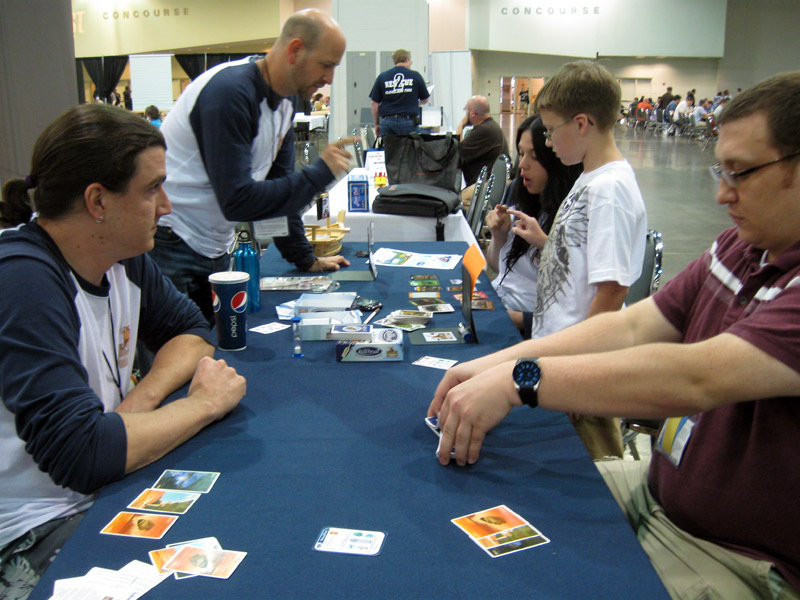 After teaching the game, Fred, T.C., John and Shawn played the sh*t out of some Troyes. Sadly, Sunday is the last day of Origins, and we’ll have to say goodbye to our friends as we head back home. But this doesn’t signal the end of Origins coverage! 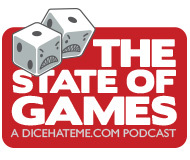 I’ll be back on Tuesday with a special podcast all about the fun, along with interviews and snippets from all the great gaming that went on, so check back soon for the rest of the gaming story. Coverage has been fun if not sad, because I’m not there! I’d like to play Sunrise City soon. 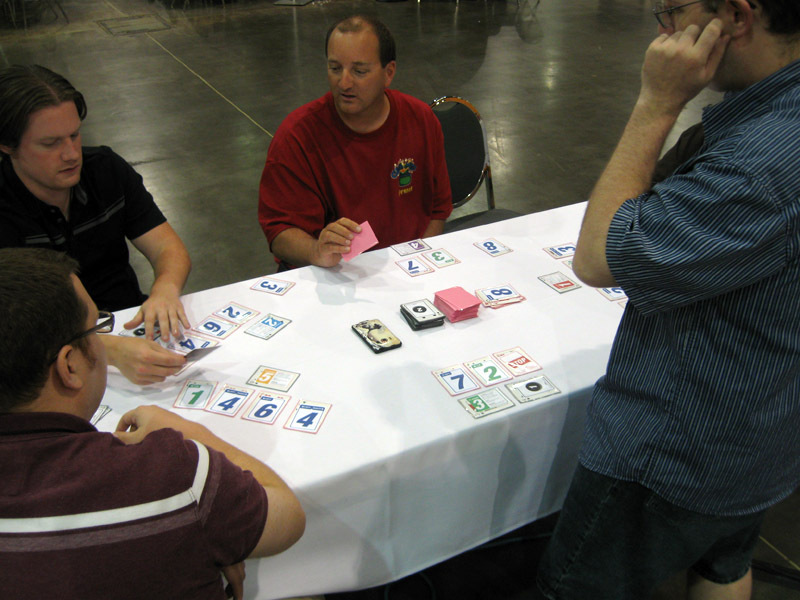 I missed the playtest at Hypermind. 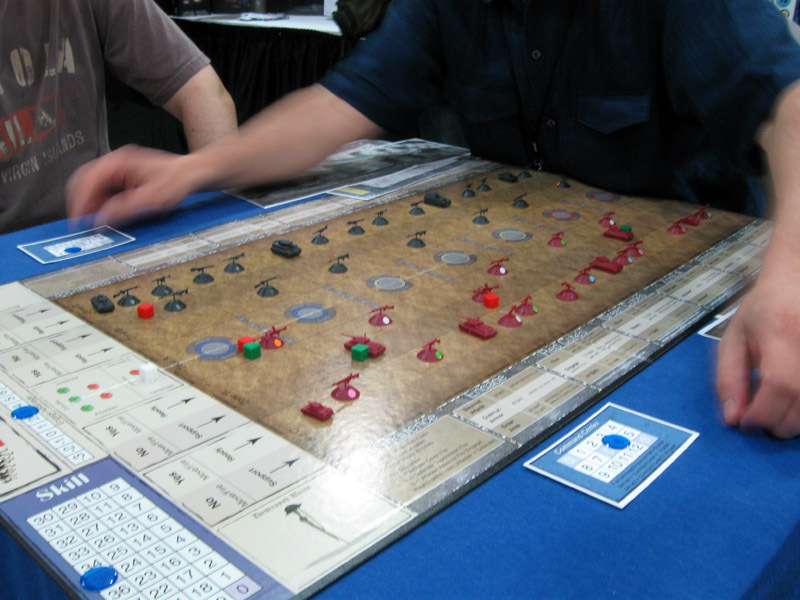 Speaking of which, I’m guessing you’ll bring the AF expansion to game night on Tuesday. Have a fun Day 4.5 and a safe drive home.